This is the CCECPSCO emergency communications trailer providing communications for the Dire Straits Exercise--a simulated collision between a passenger ferry and barge. This exercise was a multi-service three day full exercise. 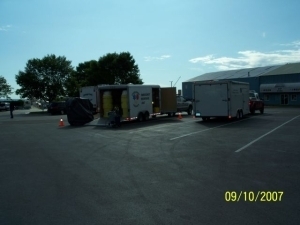 The CCECPSCO participated in association with activation of the county emergency services on day 3, deploying members to the Mackinaw City Marina (trailer staging), Joint Information Center in Mackinaw City, Checboygan County Emergency Operations Center, and other locations. 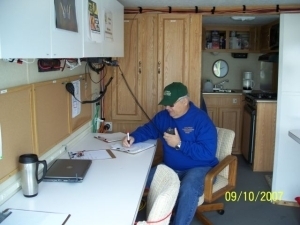 Rick Jersey KC8TU, assisted by N8DNX, served as a relay between the Dire Straits operations in downtown Mackinaw City and net control just across the Straits in Michigan's upper peninsula. 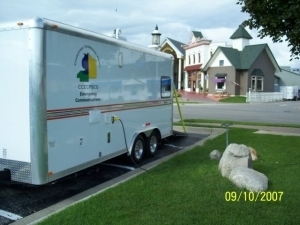 While it may look low key, the CCECPSCO trailer handled a good bit of traffic for the JIC (Joint Information Center) located in the City building across the street and other operations in Mackinaw City. Looking across the parking lot from the CCECPSCO communications trailer were a few of the support trailers from various professional emergency services. The lot was also supposed to be the location of a simulated press event (that didn't materialize before this portion of the exercise was over). Copyright©2019 Charlevoix, Cheboygan, Emmet Counties Public Service Communications Organization - Produced by Gaslight Media, All Rights Reserved.